Biopsy results: I just received word from that "stat" biopsy I had last week. The good news is that the area of concern is not cancerous. Actually, that is REALLY good news! However, it also indicated the "ulceration" was not viral or an infection. So, the bottom line is that I have no idea what is causing the issues I have been having, since the MRI's were also thankfully negative for cancer. Honestly though, as long as it is not cancer, I breathe a big sigh of relief. God is so good! When I first thought what I was experiencing was a slew of cancer symptoms, my mind went to "what if this puts me into terminal (stage 4) cancer---what would happen to the things I feel like God has called me to, like homeschooling for example". But, I was reminded again through scripture and prayer with friends that God has a plan bigger than my own. I need to trust him. He has called me to these things according to His plan for my life. My new treatment protocol: A very recent study has shown that a different drug (exemestane) than the one I am currently taking (Tamoxifen) outperformed Tamoxifen when both were combined with ovary suppression. You see, my type of cancer grows with estrogen. Tamoxifen works to block the estrogen receptor sites, whereas the other drug sort of searches out and destroys estrogen that is hanging out in my body. But, it is typically given to post-menopausal women. In pre-menopausal women, the estrogen level is way too big for exemestane even to make a difference. This is why Tamoxifen has been the drug of choice for oncologists to prescribe pre-menopausal women. This is also why the recent study compared the two drugs while both were combined with ovary suppression (either by ovary removal or suppression via drug). A couple of days after I saw the published article about the study results, my oncology nurse called me and told me that my oncologist wanted me to shut down my ovaries and wanted me to take this drug. I think it is pretty cool that she told me she instantly thought about me when reading the study results. I have had all sorts of problems with Tamoxifen and with my ovaries. So, I had my first $6,000 monthly Lupron shot a couple of weeks ago. I just had labwork that showed that I am still apparently pre-menopausal though, so it is not yet working. My next step is to meet with a surgeon to discuss ovary removal (a much longer term solution). I need as little estrogen as possible in my body. Once my ovaries aren't producing estrogen (either by the prescription suppression or by removal), I can switch from Tamoxifen. Hooray! Estrogen mimicking chemicals in things we use every day: Speaking of estrogen, I just recently read an article indicating that many of the "BPA-free" bottles and cups we use still leach substances that mimic estrogen. That was the whole purpose of being "BPA-free". BPA is an estrogen-mimicking chemical. A study published in the journal, Environmental Health, found that a number of plastic containers — including blue Nalgene and Camelbak water bottles, Lock and Lock food storage containers, and AVENT baby bottles — leached these estrogen-mimicking substances. In some products, researchers observed chemical seeping occur under normal use conditions, while others leached only after exposure to UV light or heat from a microwave or dishwasher. While the study didn't name the specific endocrine-disrupting chemicals found in the containers, previous research shows that estrogen-mimicking compounds could have a number of serious health effects. Triclosan, in particular (a chemical found in many antimicrobial soaps and some cosmetic products) is a known carcinogen. Bottom line, we are no longer trusting our "BPA-free" safe stuff. We are switching to stainless steel and glass. Luckily, most of our cups are stainless steel or glass, but we still use periodically. In fact, there is a cup that Abbey uses every day that is plastic. So, we are making changes there. You can click here to see if a cup/bottle you use is on the "bad" list of the ones that were recently tested. I mentioned in a previous post the dangers of some of the many chemicals,which are known endocrine disruptors (most mimicking estrogen), and which are found in the products we use as men and women every single day. In an upcoming post, I will dive into this deeper, and make some recommendations for some awesome new products I have used in place of the old ones. I have even noticed a wonderful difference in my skin since changing. Photographer mom: I think the "photographer momma" is rubbing off on our kids. Abbey saw a little white stool in our garage and asked to bring it in the house a couple of days ago. She proceeded to put it in the entry way, where our best natural light is located. 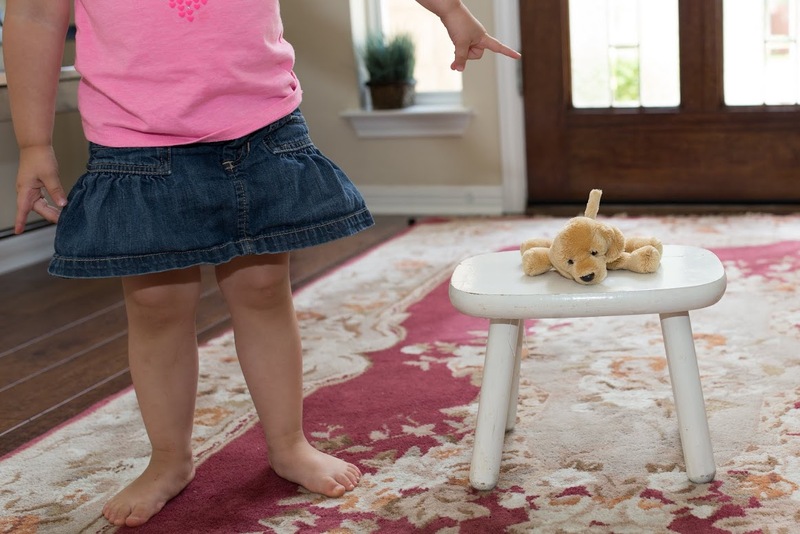 Then, she positioned her stuffed puppy on the stool and asked me to take its picture. Of course, I obliged. Abbey wouldn't pose in front of the camera though. But, Luke surprisingly obliged. He said he wanted to have a picture taken of him and his puppy. Luke's puppy is super-special to him. 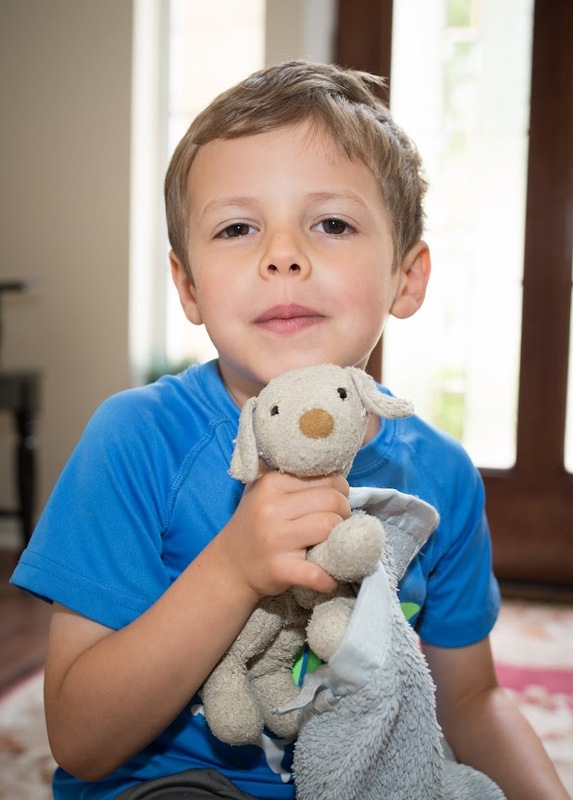 His puppy and blue blanket are his special "lovees". I am not sure what we are going to do when his little puppy falls apart. He will be so saddened. Then, he said, "make sure you get a picture of me hugging 'puppy'". Of course, son. I'm glad I got a photo of him and his "lovees". Someday, when he asks me about them, I can pull these photos up. Dinosaur Video: Lastly, remember that dinosaur that I mentioned that we saw last weekend. Well, I figured my description really probably didn't do it justice. So, here is a short little video of it. Please ignore my awful laughing.